Unless you can stand deep soul-searching, don’t read this book. Emmett Till’s body was exhumed in Illinois almost a half century after his murder in Mississippi, to try to ascertain whether there might be evidence involving anyone other than Roy Bryant and J. W. Milam in the murder. Bryant and Milam had been acquitted in a trial in 1955 in which the jury deliberated only 67 minutes. Milam had died in 1980 and Bryant in 1994, so they could not be tried in federal court. But might there be someone else who could be? Although it does not ascribe a starring role to Emmett Till, it is fitting that this book begins with a description of the exhumation of the body of Emmett Till in 2005, a half century after his murder. Brown v. Board of Education in 1954 set the stage, but that day in December, 1955 when Rosa Parks refused to go to the back of the bus in Montgomery, Alabama could well be designated as the beginning of the civil rights struggles of the 1950s and 1960s. But America’s attention was riveted on Jim Crow by the murder of fourteen year old Emmett Till a few months earlier in August, 1955. The murder and the rapid acquittal of the murderers reportedly stiffened the spine of Rosa Parks for her stand against segregation. The murder of Emmett Till was an important milestone in my own development regarding race relations. In 1956 Look magazine published in graphic detail an account of the murder of Emmett Till and the acquittal of his murderers. I had read the account in Look and was commenting to an older acquaintance regarding the injustice of what had taken place. His response was, “That black boy just shouldn’t have whistled at that white woman.” My acquaintance was not a redneck racist. In fact he was an educated and enlightened citizen relative to his peers in that part of Texas. He would in no way have countenanced the Jim Crow justice which had befallen Emmett Till. My response was emotional and empathetic; his was strictly utilitarian. From the utilitarian standpoint, of course that black boy should not have whistled at that white woman. The stage was set for racial violence, primarily but not exclusively in the South. 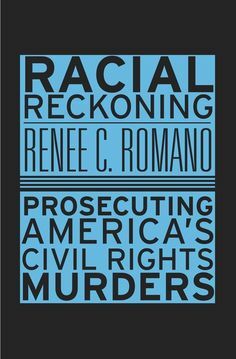 Racial Reckoning: Prosecuting America’s Civil Rights Murders provides an overview of that violence and of the original Jim Crow style justice: Emmett Till, Medgar Evers, Cheney, Goodman, and Schwermer, the four little girls killed in the 16th Street Baptist Church bombing in 1963, and a host of others, some mentioned in this book and some not. But the meat of the book is to be found in the resurrected search for judicial justice in the late 20th century. Cold cases just wouldn’t stay cold, in spite of Roy Bryant’s objection, “Emmett Till is dead. I don’t see why he can’t just stay dead.” Romano describes and comments on a number of new trials. But the trials were always of individuals. You can’t bring an unjust system up for trial and punishment. And the surviving perpetrators of those civil rights murders were getting long in the tooth. Many of them were in wheel chairs, walked with walkers, or had oxygen tubes in their noses. What good is there in putting them in prison? But the legal system does not ask such questions. Besides, there was a cleansing value for the system in bringing individuals to justice. At least the appearance of a cleansing value. The scapegoat has been sent into the wilderness. We’re clean now. But it will take more than sending a few old men to jail before we can really be clean.